As the founding Director of the Balboa Park Online Collaborative, Rich has set a new standard for cross-institutional collaboration. 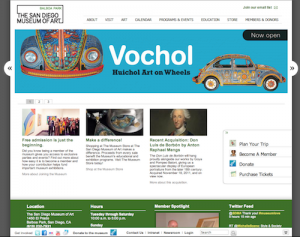 In just three years, the Balboa Park Online Collaborative (BPOC) launched 24 redesigned member websites on a common open source platform as well as re-launched balboapark.org with an exciting new design – together which resulted in an increase of more than 25% in traffic and conversion of many visitors to museum on-site visitors. In recognition of the Park’s need for a more seamless technological infrastructure, BPOC created a mobile park guide for both iOS and Android device users giving visitors access location-based information and turn-by-turn directions for multiple museums in order to streamline administration, technical support, design, content creation, and management. By deploying a common CMS for the park websites, the staff at BPOC allowed park organizations with limited resources greater access to a number positive changes including the ability to participate in robust web content creation; the ability to efficiently provide technical support to a growing membership on the part of the BPOC; and the ability to add additional online tools and deploy them across multiple institutions. 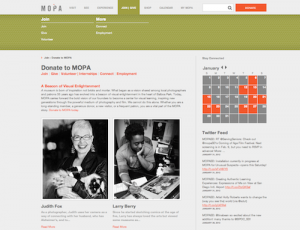 And, since Drupal had experienced an innovative adoption within the museum community, such as by Indianapolis Museum of Art’s content sharing site, ArtBabble, as well as the Art Institute of Chicago’s online scholarly publications tool (http://www.artic.edu/aic/books/online/), it was the open-source platform of choice. For some members, prior to the redesign, only a staff member with HTML skills could create changes, and sometimes those changes and updates took up to three weeks to complete. However, after the redesign, website access became more user friendly, flexible, and better reflected the participating museum brands and missions. 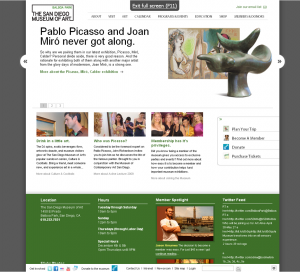 The Drupal content management systems allowed museum staff to view their sites as they worked and to adapt feedback from their colleagues and visitors allowing for a truly collaborative atmosphere. For some of the smaller institutions, this meant gaining instant access to resources and expertise that would not have been able to afford on their own.